OK Tedi Mining Ltd in Western has become very successful since the Government took over the mine from the PNG Sustainable Development Programme, Prime Minister Peter O’Neill says. He told Parliament yesterday that the Government was not wrong in taking over OTML in 2013. “This parliament was not wrong in taking over the Ok Tedi mine,” O’Neill said. “It was not my intention to take over Ok Tedi mine, it was not the Government’s intention. 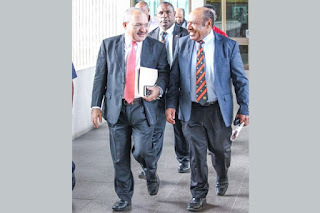 “This was suggested to me by the former chairman Ross Garnaut and the current chairman Mekere Morauta. “They wanted to shut down the mine and I said this cannot be possible. That is the truth. O’Neill said a briefing he received from OTML management and directors last week showed that the company was doing well. “We’ve restructured the mining operations in Ok Tedi. When we took over the mine, the mine was valued at less than US$500 million (about K1.6 billion),” he said. “Today the mine is making money. It also had debts of close to US$200 million.